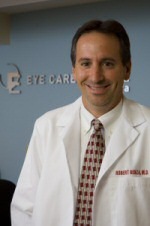 Many patients say, " I feel like I have something in my eye". We call this a foreign body sensation. Actually, some patients many have an object or debris and others just a scratch, dry eye or abrasion. I saw two interesting patients today who had wind blown debris in the eye imbedded under their upper eyelid. Obviously, when they blink their eyelids, this creates a vertical scratch on the cornea which can become very uncomfortable. If the debris is loose, we can use a Q-tip to gently wipe the object from the eyelid and remove the problem. I did this twice today and the patients were very happy. However, I warned each patient that they would still feel the scratchy cornea for a few days. I placed them on artificial tears during the day and an ointment or gel at bedtime to keep the cornea lubricated while they sleep. This allows the cells of the cornea to heal quicker and for the patient to be more comfortable over a few days. If you ever have an eye irritation, flush eyes well with water. If the symptoms persists, see your eye care professional.